Brooks made a custom walnut peninsula for me and it's really beautiful and fit perfectly. My one criticism is they don't take credit cards. 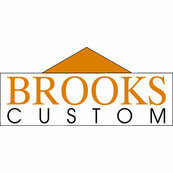 I have used Brooks Custom for many jobs. I find their work to be exceptional and and highly recommend them. Thank you so much, Laura. It was a pleasure working with you!